Your overall goals during a crisis should not simply be to keep your company or client’s head above water. In terms of time, your goals should be to protect your or your client’s long term image, and to shorten the life cycle of the crisis. In regards to necessary actions and reactions during a crisis, you should inform employees, make strategic decisions, show control, and then create an appropriate image and reputation to limit negative consequences. 1. Is the public in jeopardy? 2. When reported by the media, would public trust be jeopardized? Never let others define the story. The easiest way to define your story is to execute your action plan as soon as the crisis hits. 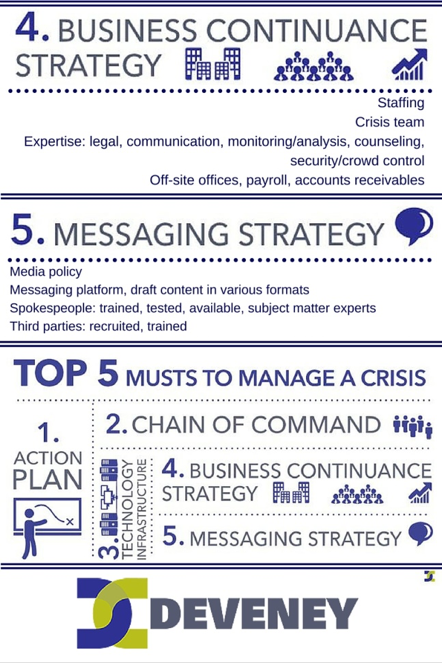 Check out the infographic below to see exactly what your action plan should encompass. Have any other musts to manage a crisis? Tweet us @DEVENEYMKTG and let us know!